Flamenco is one of the folk music genres of Spain. In Spain the word flamenco is not just associated with the guitar but also the people, songs and dances of Spain. The history of flamenco follows that of Spain. When the Moors ruled Southern Spain they brought with them their instruments and the most important of these was the Oud. This eastern lute is still to be found all over the world but in Spain it collided with European ideas and flamenco is the product. Flamenco is woven into the life of the region of Andalucia where it originated and the people actively engage in the songs and dances. The guitar has always been the main instrument used in flamenco to support the dancers and singers due its percussive timbre. The early flamenco guitarists very rarely played solo; their role was purely to provide music for the dancers and singers. The rise of the solo flamenco guitarist is a late development and many of the great flamenco soloists are also renowned for their ability to accompany singers and dancers. The modern classical guitar and its physical development can be traced back to the Spanish guitar-maker Torres. Alongside the classical guitar is the flamenco guitar. The flamenco guitar has the same history and the greatest luthiers in Spain have always made both types of guitar. The main structural difference the flamenco guitar has in relation to the classical guitar is a thinner body. This creates a timbre that is sharp and percussive. This is considered the ideal sound with which to accompany dancers. The flamenco guitar also has wooden tuning-pegs, which is the traditional method of construction for all early guitars. The need for the classical guitar to be able to be heard in a concert hall and the demand for greater resonance from classical composers; means that the classical guitar has left behind the use of wooden tuning-pegs and its body size has increased in comparison to the flamenco guitar. In many respects the flamenco guitar is similar in construction to the guitars of earlier centuries. Paco de Lucia and Sabicas are two flamenco guitarists that students of the guitar should be aware of. Both have played a major part in the changes of this evolving art form. Sabicas developed the technique of tremolo and Paco de Lucia extended the harmonic framework with his use of jazz chord voicings. Juan Martin is a flamenco guitarist who keeps the traditional forms sharply in focus and provides the clearest guide for beginners wishing to study the various flamenco forms. 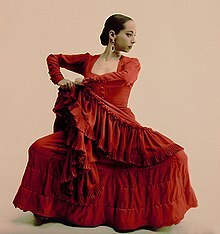 The flamenco forms have been developed over a long time. There is a distinction of terms when flamenco forms are described. When flamenco vocal forms are described they are called "cantes" and the guitarist forms are called "toques". Each flamenco form has certain rhythmic and tonal qualities that encapsulate the form and flamenco guitarists are expected to have a knowledge of the origin and usage of these. This is a very common chord progression that most guitarists who wish to learn flamenco start with. A descending one octave Phrygian mode starting from the note "E" which can be played over the above chord progression. Rasgueo - this is the most common strumming technique for flamenco. The right-hand is formed into a closed fist with the thumb resting against the guitar or low E string for support, and each finger is flicked out one at a time (4-stroke rasgueo) to sound the strings with the nails. A common variation is to use the technique with only the index finger. The index finger is also used for the up-stroke which only strikes the treble strings after the completion of the 4-stroke rasgueo.